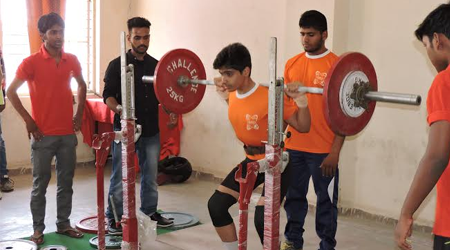 40th Madhya Pradesh Power Lifting Championship was inaugurated on 27th May, 2016 at Oriental auditorium to celebrated the spirit of sports amongst youth in today’s scenario at Oriental College of Technology, Bhopal in association with MP Power Lifting Association. The Inaugural Ceremony was held at Oriental Auditorium at 10 am on 27th May, 2016. The event was graced by benign presence of Madhya Pradesh, Shri Surendra Nath Singh, Hon’ble MLA, Central Bhopal, Shri Om Yadav, Hon’ble Chairman, Bhopal Development Authority, Shri Praveen Thakral, Chairman, Oriental Group of Institutes, Bhopal, Shri K R Tiwari Secretary MP PLA , Dr. Kavita Burse, Director, Oriental College of Technology, Shri Ramesh Kumar Dave, Rt. PCCF, and Raji Ali Baig, International Referee. This championship was attended by athletes and sports officers from 25 districts of Madhya Pradesh. More than 500 participants male and female are competing in for junior, sub junior, senior and master category in this event. The event will conclude on 29th May 2016. Oriental College takes pride in providing students expert technical education and wholesome ambience which shapes their overall character. In order to inculcate disciple and sportsmanship and promote sports activities amongst students, Oriental College organizes host of Sports event round the year in addition to its rigorous academic curriculum.